If you’ve ever walked into a house and left feeling like you need to make a serious change at home, it’s not always a matter of the cost or available space. Sometimes all it takes is a little reworking of furniture to give your space a completely rejuvenated feel! We’ve compiled some of the tricks-of-the-trade that set designers use to make the idea of a room seem brand new. These changes can be so subtle that you wouldn’t assume they’d have such an effect on how a room looks. 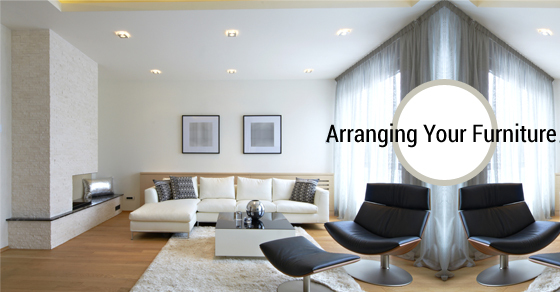 When you go to most homes, you’ll notice that furniture is pushed right up against a wall. Space is a commodity, so it makes sense to try and make the most out of it, but sometimes there is wiggle room for something different. Keep at least an inch of space between furniture that sits near a wall and the wall itself so the room doesn’t seem so claustrophobic. For furniture that’s near the centre of the room, you can even slant the pieces to make a dramatic effect. This is also great for seating that seems more intimate, since you’ll be closer to facing each other while comfortably seated. If you’re having trouble squeezing between the different couches, tables, chairs, and walls, then the size and amount of furniture needs to be adjusted. Consider buying minimalist couches that have low backs and narrower seats. Instead of a coffee table, invest in a sleek side table for drinks and other items. If you don’t have a large family, you can also omit from having side chairs. Keep it sleek and simple when you aren’t working with much space. Some places don’t just use windows as a source of natural light. it’s easy to try and treat bay windows (large windows that line the walls) or sliding glass doors like they’re walls once you’ve closed the window dressings. Unfortunately while doing so, you’re missing the opportunity to play up your natural lighting options! Keep furniture near the windows low, whether that’s a headboard or a sofa, so allow the room to remain sunny throughout the day. For more advice on expert styling and design of you rooms, contact the experts at Avonlea today!